Donald Trump may not have given much credence to the pointed personal warnings about North Korea he heard from his predecessor. After getting briefed on Pyongyang’s efforts to build a nuclear weapon capable of reaching the United States, Trump blithely tweeted, “It won’t happen!” All that North Korea has done since should have overcome both his skepticism and his assurance. Every few weeks since January 20, it has launched a new and better missile. U.S. spy satellites have registered flurries of activity around its underground nuclear-test site. A visiting American college student detained for stealing a poster arrived home in a life-ending coma. And this week, a smiling Kim Jong-un marked July 4 with what he called a “gift” for the “American bastards”: the first test of a ballistic missile, a Hwasong-14 “as handsome as a good-looking boy,” that most analysts believe could hit Alaska. After years of mocking Barack Obama for passivity in the face of North Korea’s growing nuclear-weapons stockpile, Trump confronts the same grim set of choices. As seemingly every article on the July 4 missile test has stressed, those choices are “few and risky” and have been for years. Yet, after six months of Trump’s presidency, they are grimmer than ever before. His degradation of language, his destruction of American diplomacy, his disdain for alliances: Trump’s foreign policy has wrecked the very tools needed to navigate a crisis that would be frightening even under the stewardship of the most judicious commander-in-chief. The options were always bad, but Trump has made them considerably worse. “The era of strategic patience,” Trump recently declared, “is over.” Strategic patience was the Obama administration’s attempt to put the best possible spin on a tacit admission of paralysis. North Korea tested nuclear weapons (first under Bush, then repeatedly under Obama), developed missiles, issued flamboyant threats, and repressed its citizens by outlandishly brutal means. In turn, Washington toughened sanctions and, according to subsequent reports, waged a cyberwar on the North Korean missile program. But major changes to U.S. policy were seen to carry disqualifying drawbacks or intolerable risks — drawbacks and risks that persist today. Candidate Trump, like candidate Obama before him, said he’d be willing to talk to Pyongyang directly. 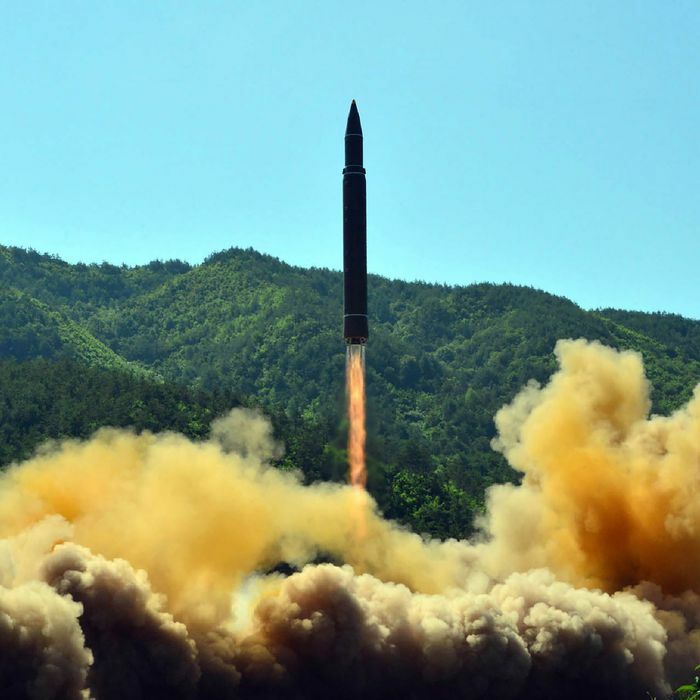 But returning to negotiations without insisting that North Korea give up weapons, or at least stop further development, would reward bad behavior and undermine nonproliferation on the basis of minimal hope that a sustainable compromise would emerge. Successive U.S. presidents have hoped that stronger economic pressure would make Pyongyang more pliant, but its economic lifeline comes via China, which prioritizes North Korean stability. Looking to Beijing as his deus ex machina, Trump has tried alternately to browbeat (“If China is not going to solve North Korea, we will”) and to sweet-talk (“he is trying very hard”) Chinese president Xi Jinping into increasing pressure on Pyongyang. (Whatever his disregard for Obama’s attempt to educate him, Trump was readily swayed by Xi: “After listening for ten minutes, I realized it’s not so easy.”) As it has become clear that China is not going to solve the problem on its own, the administration has instead started sanctioning Chinese companies that do business with North Korea; Beijing’s calculus has not changed. Trump has also warned of a “major, major conflict” with North Korea. But even an overwhelming strike on the known nuclear stockpile would have little chance of destroying North Korea’s ability to respond with thousands of weapons, including any surviving nuclear weapons, currently trained on both American troops stationed in the region and tens of millions of citizens of American allies; half of South Korea’s population lives within easy range of North Korean artillery. The ensuing battle would, Secretary of Defense James Mattis explained last month, result in “probably the worst kind of fighting in most people’s lifetime … a catastrophic war.” (One interpretation of why Mattis, who speaks sparingly in public, has issued such a stark warning: He’s alarmed by chatter from others in the administration.) American-led regime change would be similarly catastrophic. As Mark Bowden concludes in his chilling Atlantic report about U.S. policy options toward North Korea, “If there were a tolerable alternative, it would long ago have been tried.” And so, after decades of successive U.S. presidents reiterating that a nuclear North Korea is unacceptable, North Korea today has one or two dozen nuclear weapons, which it insists it will not give up. This week’s test suggests that even sooner than previously thought — perhaps within a couple of years — it could also have an intercontinental ballistic missile that could reach some major U.S. cities, along with nuclear warheads compact enough to put on top. The Trump administration followed the July 4 test with a barrage of statements and actions that offer little that is truly distinct from past policy. Generals ordered joint U.S.–South Korean missile exercises and reminded the North Koreans of what American firepower could do to them. United Nations ambassador Nikki Haley called for “an escalated diplomatic and economic response” and put other governments “on notice” that Washington would act alone if it had to. Trump complained of Pyongyang’s “very, very bad behavior” and promised he was considering “some pretty savage things.” Crudeness aside, these are standard sentiments and proclamations from U.S. officials — but in this case, coming from an administration that has undermined its own ability to act on them effectively. America’s word has been devalued under Trump, creating a degree of uncertainty that sharply raises the risk of calamitous miscalculation. Credible deterrence hinges on the person you’re trying to deter believing that you will do what you say you’ll do. Yet politicians in Trump’s own party ignore his threats; why would enemy governments take them any more seriously? When Trump issues a statement, even members of his own administration are frequently unsure what it’s supposed to convey. Last month, American officials reported that they were “still trying to gauge the meaning of the president’s tweet” about China and North Korea — just before a high-level meeting with their Chinese counterparts to discuss, among other things, that very topic. In April, White House officials trumpeted news of an aircraft carrier heading toward North Korea — at a time when the ship was in fact sailing in the opposite direction. American diplomacy, meanwhile, has been debilitated. Trump has sidelined the State Department and proposed cutting its budget by almost a third, while stocking his administration with active-duty and retired military officers. He has left the senior diplomatic ranks unfilled; “acting” career officials, however capable, are left to do their jobs with no political support, and foreign officials are well aware of their relative powerlessness. And Trump’s recent public undermining of Rex Tillerson’s attempt to resolve the Qatar crisis sent a strong message of how little he cares about the efforts or opinions of his secretary of State. But these are the very officials and tools Trump would need to rely on in a crisis — not only in the case of a new push for negotiations, but even more so were he to prepare for a military offensive or attempt to step up economic pressure, which requires skillful diplomacy to ensure that sanctions are enforced rather than ignored. Finally, American alliances have been destabilized. Any constructive policy depends on the trust and cooperation of American allies in Asia, but Trump has sowed unprecedented doubt about American commitments. He has repeatedly questioned the value of alliances globally. He has suggested that Japan and South Korea should consider developing their own nuclear arsenals instead of relying on American security guarantees. He has demanded retroactive payment for an American missile-defense system in South Korea. He has issued threats with potentially fatal implications for American allies without ever consulting them. The supposed “adults” in the Trump administration have worked feverishly to persuade allied governments not to take such statements seriously, but given the existential stakes for South Koreans and Japanese, it’s easy to see why they might not fully trust American alliance commitments in a crisis. When such commitments are in doubt, an adversary is more likely to attack an ally, and allies are more likely both to cut side deals, undercutting pressure, and to act alone, upsetting restraint. Secretary of State Tillerson was right when he declared this week that “global action is required to stop a global threat.” But here, too, Trump has made bad options worse. The rest of the globe is less inclined than at any other time since the lowest point of the Bush administration to follow where Washington leads. According to the most recent Pew survey, international confidence in American leadership plummeted from 64 percent at the end of Obama’s presidency to 22 percent today. Dyed-in-the-wool America First–ers may not think they particularly care what the citizens of foreign countries think — until suddenly we are calling for “global action” in a crisis and find that few of them are willing to come forward and join us.